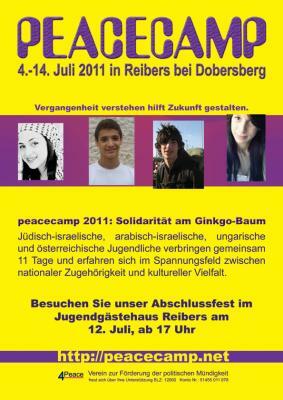 Please take notice of the revised timetable for peacecamp 2011. Judenplatz Holocaust Memorial Also known as the Nameless Library, the Judenplatz Holocaust Memorial commemorates the Austrian victims of the Holocaust. It's by far the most intriguing and moving installation of its kind in the country. 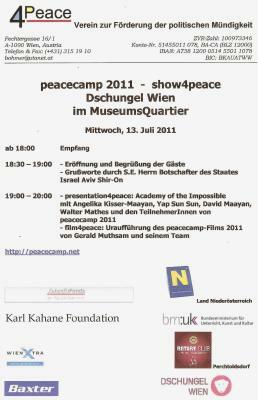 The Holocaust memorial in Vienna was an original initiative of Simon Wiesenthal, a well-known spokesman for Holocaust victims. Designed by the British artist Rachel Whiteread, it took many years to complete due to numerous political and aesthetic controversies. The 4-metre tall steel and concrete construction was finally unveiled in 2000. The installation features cast library shelves that seems as if they have been turned inside out. The book spines face inwards and the titles of books cannot be seen; neither can their content. The shelves seem to be occupied by countless copies of the same book, which represents the staggering number of the Holocaust victims. The image of the book refers to the common concept of the Jews as the People of the Book. Part of the installation is also a large double door with the panels turned inside out, deprived of handles or knobs and thus impossible to open. 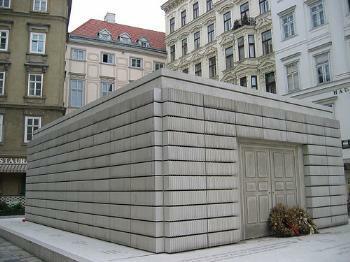 The memorial has been internationally acclaimed as pointing to the blank space in Europe's cultural tissue that was generated by the Holocaust of the European Jews.